Yo, what’s going on podcast family? Alex, here I want to talk to you about more equals more. So often we get stuck and go, “Man I need more sales. I need more prospects. I need more exposure. I need more referrals. What do I do?” Well, on the other side of that more is something you need to do. So, when I think about my business, I look at, what do I need more of? Do I need more exposure? Well, I better put out more content. If I want more authority in my space I need to put out more content. Do I want more referrals? Well, I better do more Dream 100ing. I better go out there and find more referral partners, I better make it so that it’s easy and lucrative for people to send me their clients. Do I want more sales? I better do more followup. I better hit people up some more, I better create more value in the marketplace. Do I want more sales? I better serve more, I need to support my audience more. I need to go out there and find what problems I can solve so that people will pay me to solve those problems. Am I looking for more weight loss? Do I need to do more working out, or maybe less eating? More equals more. What you want, what you want more of on the other side of that equation are you doing more of the right thing. There’s no easy way to do this. And I resonate with that, I’ve been there, but I’m like, “What are you doing to get to the other side?” Because playing more video games is not going to help, going to more networking meetings is not going to help. What are you doing more of? And I’m not saying this gal was doing video games or networking meetings I’m just saying that it’s all about doing more of the right thing so that you get the results that you want. More equals more. If you’re sitting around just trying to learn more you will not earn more, you must take action. There’s not a magic pot of gold on the other side of that book that you’re reading. I’m not saying books are bad, don’t take that. You know I love books if you’ve been following my podcast for a while, but at some point, you gotta take action. And implementation is what will get you to the next level of success. It’s not about learning. Most of the time when my coaching clients start up with me they already know everything they need to get to the other side of success, what they don’t have is implementation, and there may be a couple of dots that they need help connecting, but they already know what they need to do they just haven’t done it yet. A lot of that is implementation. Quite honestly a lot of that is mindset stuff, which I’m not going to get into right now ’cause this is all about implementation. This is the implementation episode, more equals more. If you want more sales, do more followup. Don’t worry about hearing no’s. Just talking to a potential prospect yesterday and she is just brave, she has this knack for being willing to ask the big questions, and she’s not afraid of hearing the word no. If I could take that bravery, that audaciousness that she has and just bottle it up and give it to a few of my other coaching clients woo man, she is not afraid to hear the word no, and that’s what sales is, right? The rhythm of prospecting is no, no, no, no, yes. You’re going to hear no’s along the way, but if you want more sales you gotta do more followup, you’ve gotta be willing to hear that no. Also, if you want more referral partners, if you wish that you had more people sending your clients what are you doing to make that happen? It doesn’t just magically happen. In episode four of my podcast I dove into referrals, it was my most popular episode yet. There are ways to create referrals. I don’t believe referrals just happen. I believe you need to set up referrals, put systems in place so that they continue to come in at a steady click. They don’t just happen. Having said that, sometimes the first thing you need to do is introduce yourself to a potential referral partner and serve them so that they know who you are and how you can benefit them and their customers. It comes down to more, it’s more asking, it’s more Dream 100ing, sending them a nice little package in the mail or something. It’s all about more. More action gives you more results. Please stop if this is you, if you are the person who is constantly learning, put down the books because you’re feeding that part of your brain that says that you’re doing something, you’re checking off that box, you’re making yourself feel good, stop reading start doing. There are certain types of entrepreneurs that go back to reading and learning when they get stuck, and the reason is, is because it’s easy for them. Reading and learning are easy. Joining a coaching program is easy, but that’s not going to get you where you want to go. It’s not going to help you accomplish what you want, because on the other side of that, the other side of that learning there is no reward other than having more information inside of your head. You have not done anything to move your business forward. So, if you need help, if you’re like, “Man, I just am stuck.” I want you to join my free VIP coaching program. 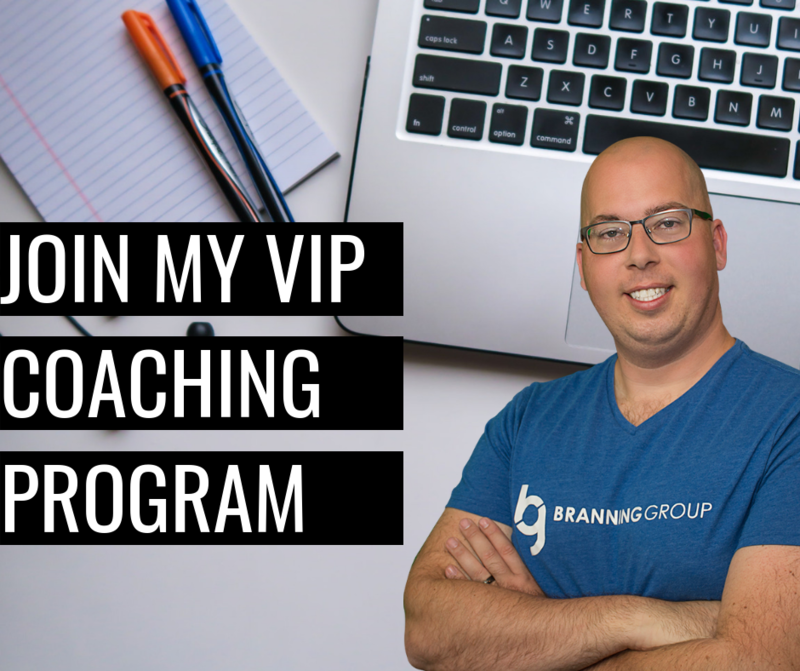 Go to AlexBranning.com/VIP, you get a free month. Check that out. We do an implementation work every single Friday. Love to have you join me, and I think it’s going to be the right fit for you. And if you need more help you can hire me as your private coach and mentor. Have a great day. I hope this inspired you. More equals more.